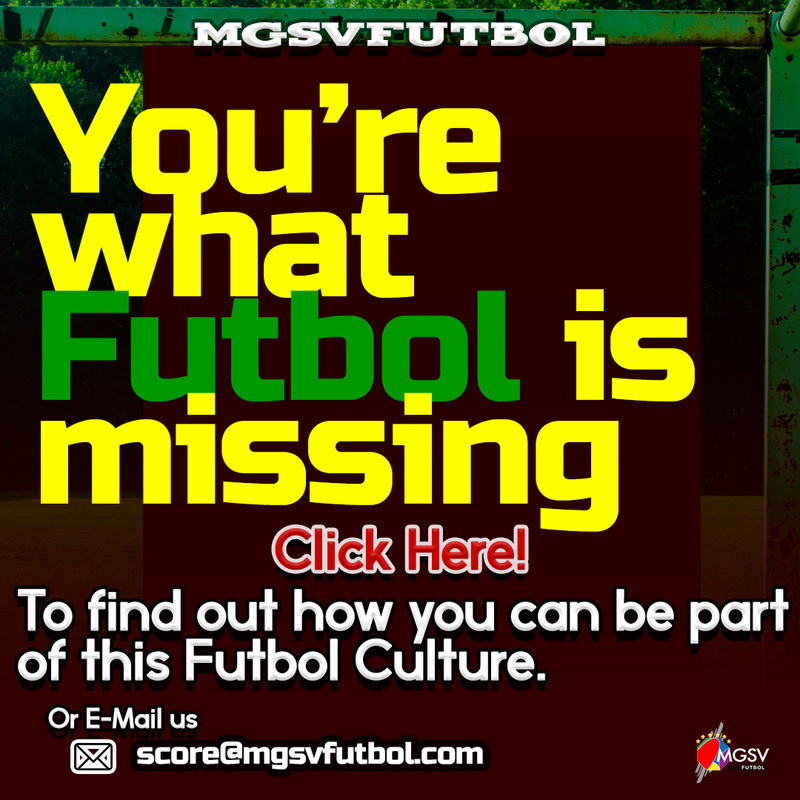 The title races, UEFA Champions League qualifications, relegation battles, and the individual awards. Liverpool has 7 more league matches to play while the remaining 5 teams have 8. 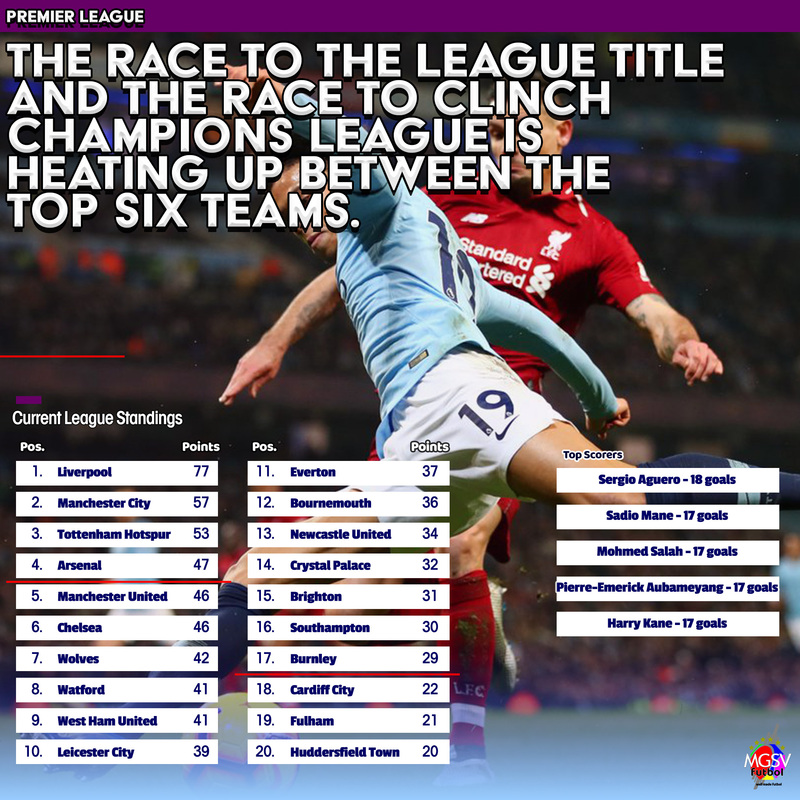 The top 6 in the Premier League have multiple routes to play secure a ticket to be part of the 2019/20 UEFA Champions League. There is the league route of finishing in the ‘top 4’ and the option of winning the Champions League or the Europa League. Liverpool, Manchester City, Tottenham, and Manchester United, all have the option of winning the 2018/19 UEFA Champions League to qualify for next season’s edition. Chelsea and Arsenal have the option to win the 2018/19 UEFA Europa League to qualify for the Champions League football. Chelsea’s advantage was extinguished in their last league match when they failed to extract points from their match in hand at the Goodison Park in the last round. Chelsea is 3 points outside the ‘top 4’ in the current standings. 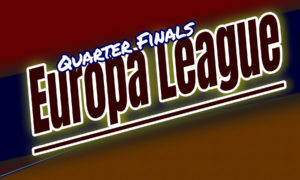 On paper, Chelsea has a more favorable draw with Slavia Prague as their quarter-final opposition in the Europa League. Arsenal drew Napoli. The Champions League route for Tottenham and Manchester United. On paper, both teams are underdogs in their quarter-final draw. Tottenham has to face Manchester City, while Manchester United was drawn against Barcelona. Final 8 Premier League matches for the 4 teams racing for the final 2 direct qualification spots in the league. The current league title race. 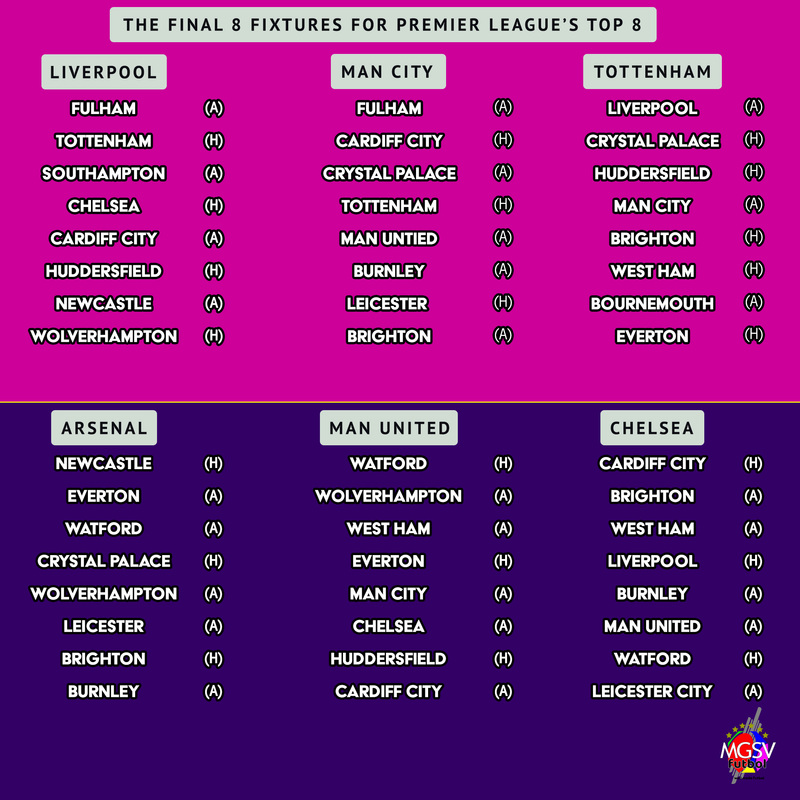 Arsenal will go through their final 8 matches of the 2018/19 Premier League without facing any of the current ‘top 6’ in the league standings, while every other top 6 side has two fixtures against a top 6 side. 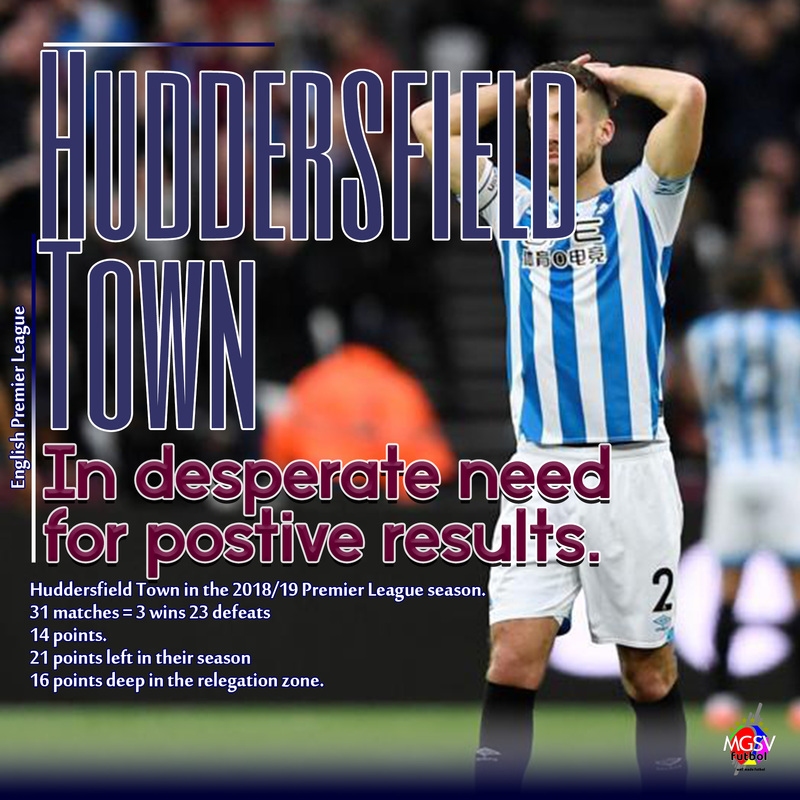 After 2 years in the Premier League, Huddersfield Town is looking likely to be the first side from the teams promoted last season to go down. (Newcastle United and Brighton are looking more alive). Huddersfield in the 2018/19 Premier League season( 31 matches = 3 wins 23 defeats 14 points). 21 points left in their season and are 16 points deep in the relegation zone. They blew a 2-goal lead against West Ham with 25 minutes of regulation time left to play by conceding 3 goals in the final 15 minutes + injury time to suffer another league defeat in their most recent fixture. Huddersfield’s final 7 league matches include fixtures against Tottenham, Liverpool, and Manchester United. Can they do the improbable? 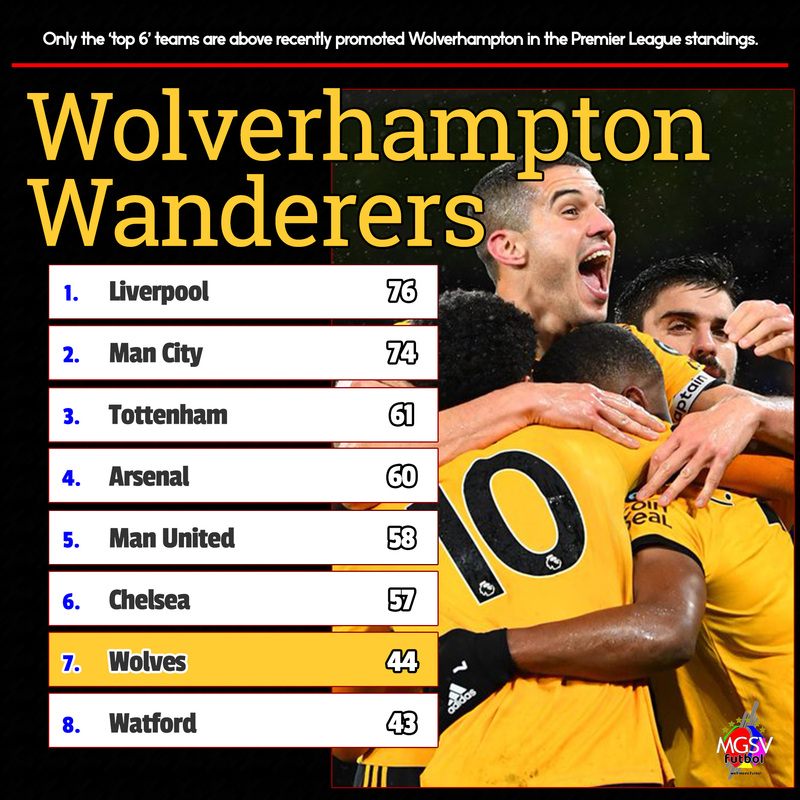 From the sides that were promoted to the Premier League this season, (Wolverhampton, Fulham, and Cardiff City), Wolverhampton is the only team that can be counted on to remain to be part of the 2019/20 season of the Premier League. Wolverhampton Wanderers is the best of the rest in the first year since promotion to the Premier League in 6 years. After picking up 3 wins from the 20 Premier League matches played in 2018, Fulham has somewhat kept up the pace by picking up 1 victory since the beginning 2019. (Jan. 29, 2019) Fulham 4-2 Brighton). 4 straight defeat to start the year, and seven straight defeat since their only win of the year. 13 point deep in relegation with just 21 maximum points left in their season. 8 matches left to go in the 2018/19 season and Bayern Munich fighting off Borussia Dortmund from the Bundesliga title. 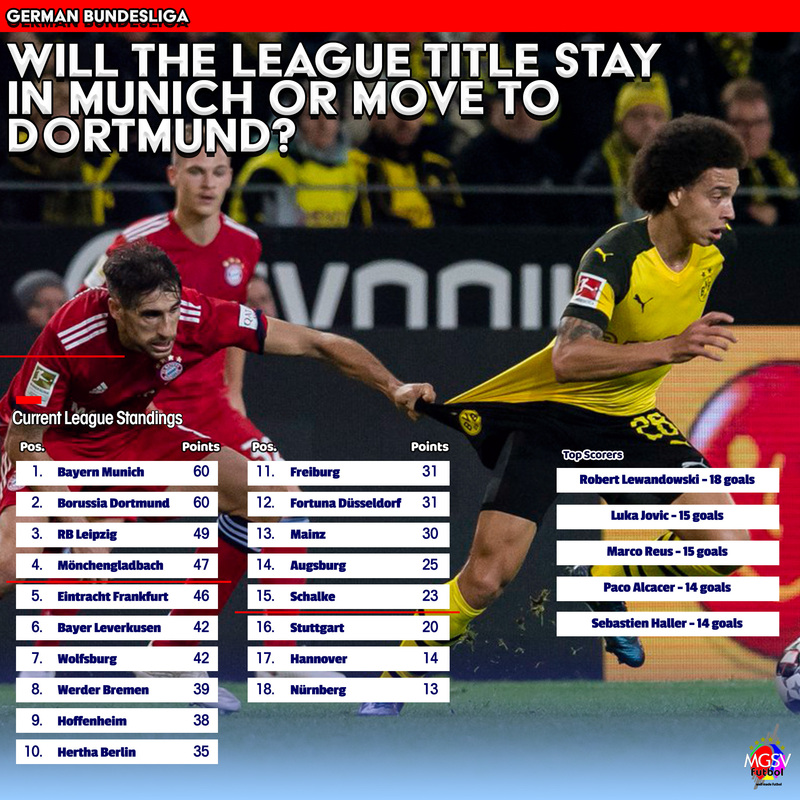 Goal-difference has Bayern Munich on top of the Bundesliga league standings, but there is a neck-to-neck tie in points between defending champions Bayern Munich and a serious contender Borussia Dortmund. Bayern Munich is 12-0 aggregate winners from their last two league matches. There is a game for both teams between now and the next Der Klassiker. Borussia Dortmund will welcome a Wolfsburg side that is currently within touching distance of European competition for the coming season. The good news for the neutrals and for the competition is that both sides will play their fixtures at the same time. Bayern Munich and Borussia Dortmund will be claiming the first two spots for Champions League football from the Bundesliga and the remaining two tickets is up for grabs. 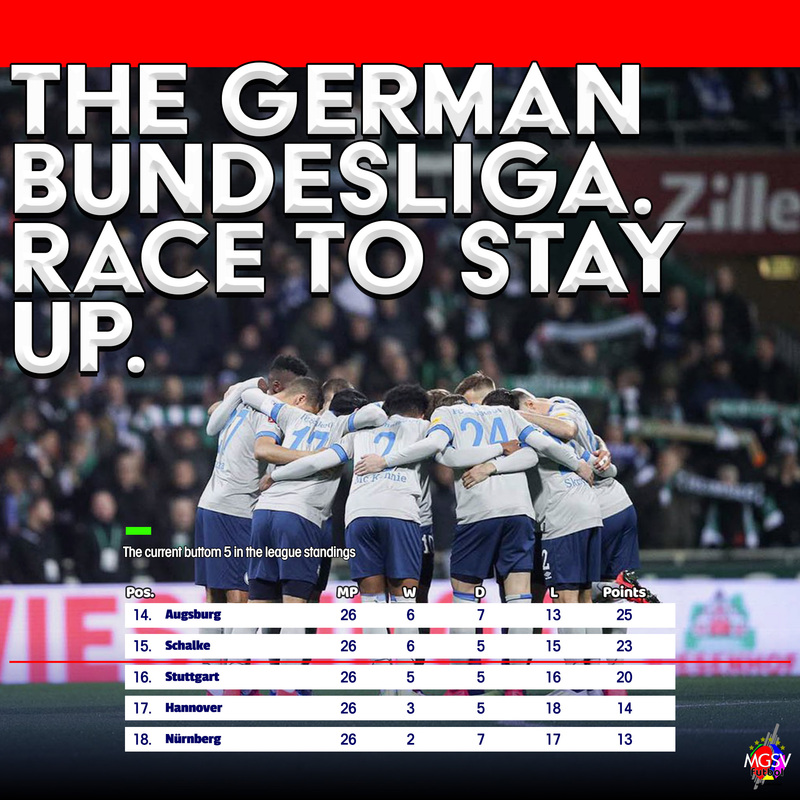 RB Leipzig is leading the way in the chase for the direct qualification spot for the Champions League. There is Borussia Monchengladbach, Eintracht Frankfurt, Bayer Leverkusen, Wolfsburg. Eintracht Frankfurt still has the Europa League route to clinch a Champions League spot for 2019/20 season. Top Scorers – Robert Lewandowski 18 goals, Luka Jovic 15 goals. Marco Reus 15. Paco Alcacer 14. Sebastien Haller 14 goals. Recent improved results have Augsburg 5 points from away from the relegation zone. Augsburg is unbeaten in their recent 3 league matches, picking up two wins including a victory over Borussia Dortmund. We can easily credit Augsburg for even race for the title. 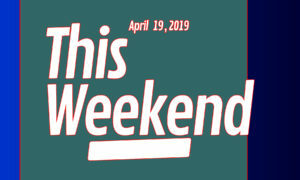 Their victory over Borussia Dortmund on Round 24 (March 1, 2019) in addition to their defeat to Bayern Munich two rounds prior on February 15, 2019 (Round 22) can calculate for the three points that allowed Bayern to finally come from behind in the league title race. Paris St. Germain is 20 points clear at the top of the league and a game in hand to possibly make it 23 points clear with just 27 points left to play for in the season. Monaco is unbeaten in Ligue 1 since the managerial return of Jardim. 7 matches = 4 wins + 3 draws. Monaco’s only away victory in this period was against Lille. A ‘1-0’ victory for Monaco at Lille has slightly opened the door for Lyon to close the gap. 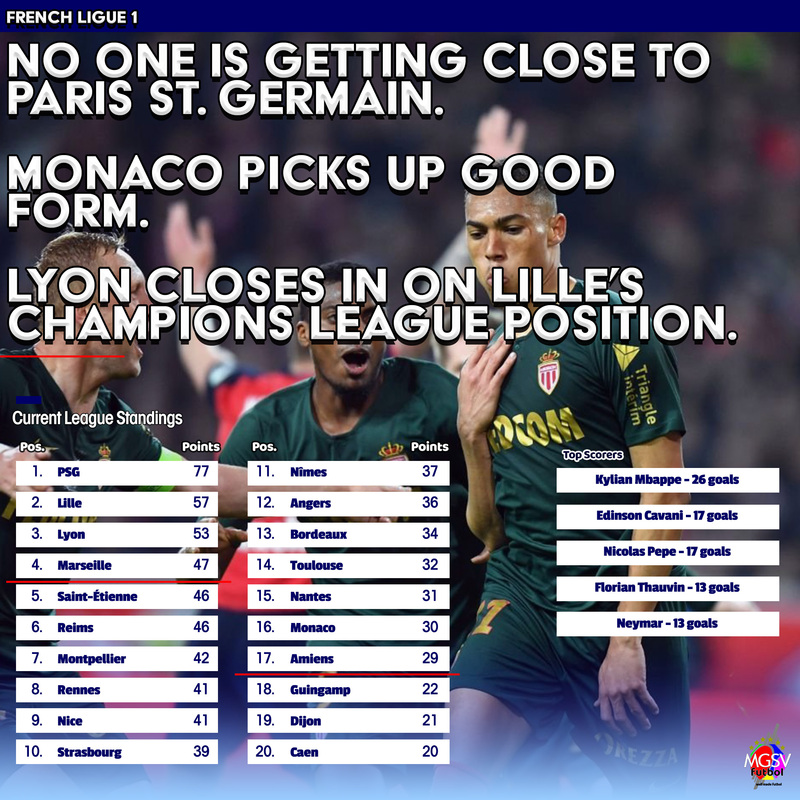 Lyon closed the in on Lille for the final UEFA Champions League direct qualification spot in the league. Marseille won 1 in 12 matches during (Nov 29, 2018 to Feb 2, 2019) before a more recent run of 6 unbeaten matches (5 wins and 1 draw) saw them climb up the league table to get a touching distance of playing part in European football in the coming season. Marseille is currently 10 points from direct qualification to the Champions League, 6 points from indirect qualification. Juventus is 15 points clear at the top despite defeat in their last match. It took 28 matches for Juventus to suffer a Serie A defeat. With just 10 matches left in the league and 15 points clear at the top of the Serie A standings, there is virtually zero doubt that they won’t go on an win their 8th straight Scudetto with any issue. 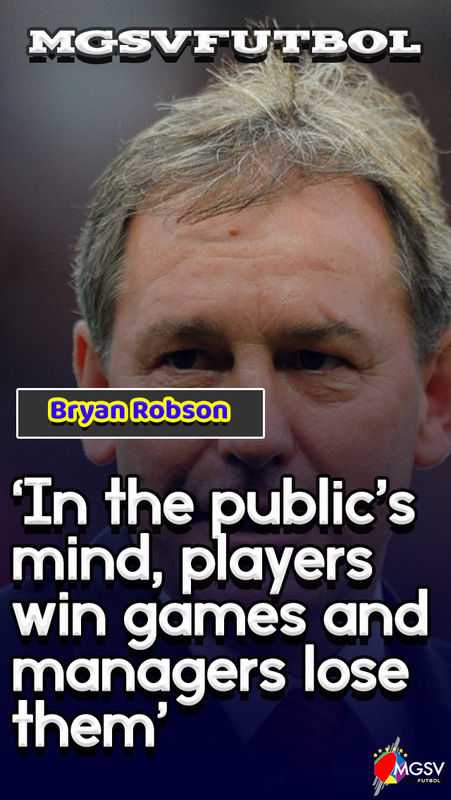 The Milan clubs are currently keeping out the Rome clubs from next season’s UEFA Champions League competition. There will be very little distraction for the four teams currently in the contest for the final 2 tickets to the 2019/20 Champions League. 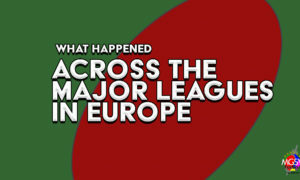 All four sides are out of European competition after a failed bid for a title. Inter Milan and Roma are both out of the Champions League. Inter Milan knocked out in the preliminary stage but dropped into the Europa League. Roma knocked out in the Round of 16 stage by Porto. AC Milan and Lazio are out of the Europa League. Milan knocked out at the preliminary stage. Lazio knocked out in the ‘Round of 32’ by Sevilla. Inter Milan knocked out in the ‘Round of 16’ by Eintracht Frankfurt. AC Milan and Lazio face off for a place in the Coppa Italia final. A goalless draw in Rome for the first-leg leaves the round open for both sides for the second-leg meeting in Milan on April 24, 2019. Top Scorer – Fabio Quagliarella 21 goals. Krzysztof Piatek 19 goals. Cristiano Ronaldo 19 goals. Duvan Zapata 17 goals. Arkadiusz Milik 15 goals. 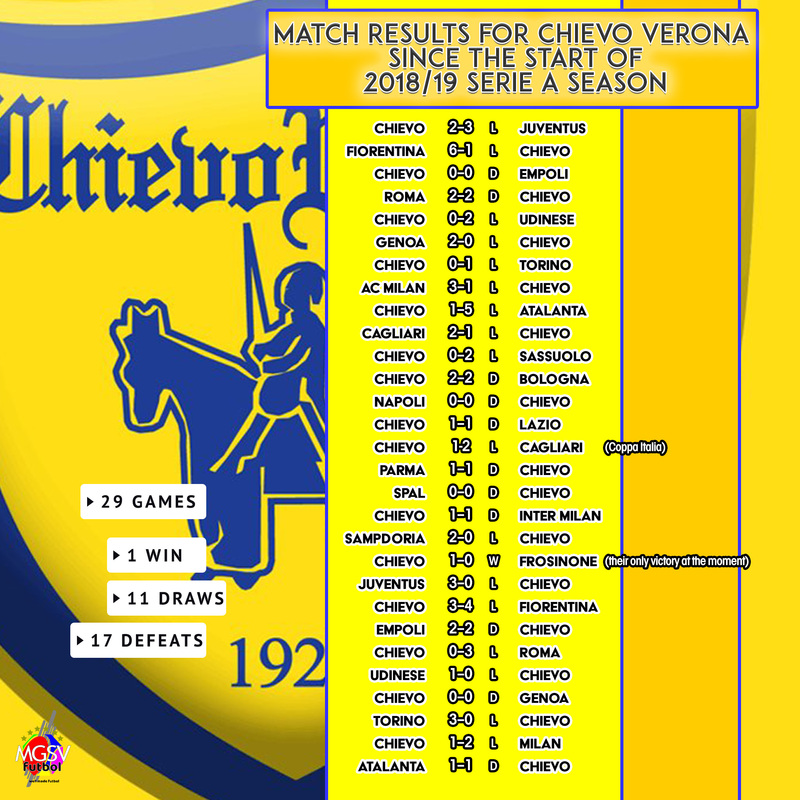 From the 29 competitive matches played since the start of the 2018/19 Italian Serie A season and so far Chievo Verona has lost 17, drawn 11, and won 1. Chievo Verona started the season with a 3-point deduction that has been recovered by they only victory from the opening 28 league matches. They’ve been at the bare bottom of the Serie A league standings ever since the second round and likely to complete the season without making a progress. Chievo Verona = 1 win in 28 games. 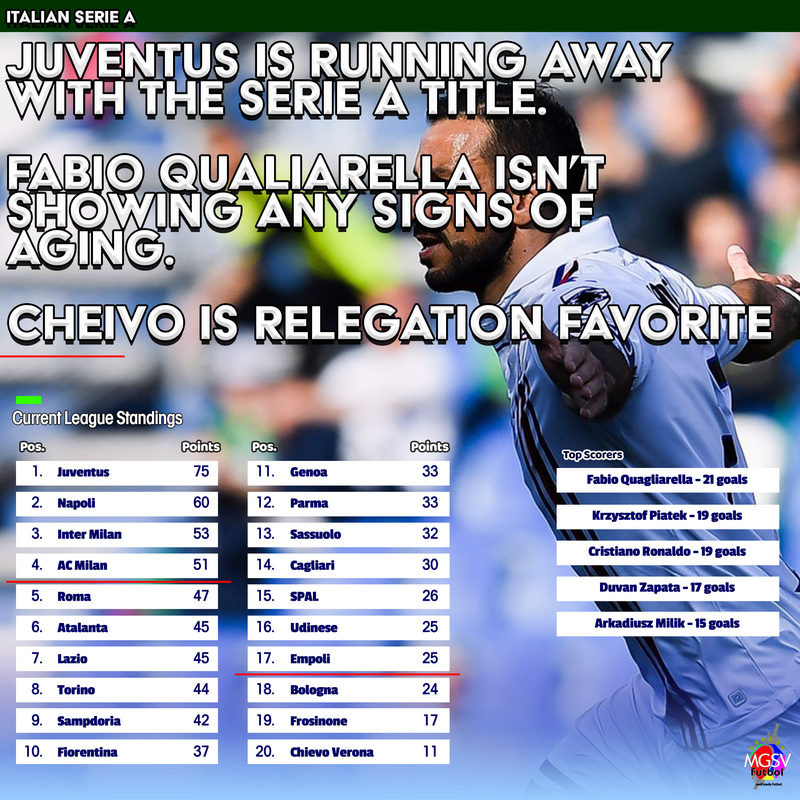 With Frosinone and Chievo Verona looking keep their place in the relegation zone, the final spot left for a Serie B 2019/20 remains up for grabs. 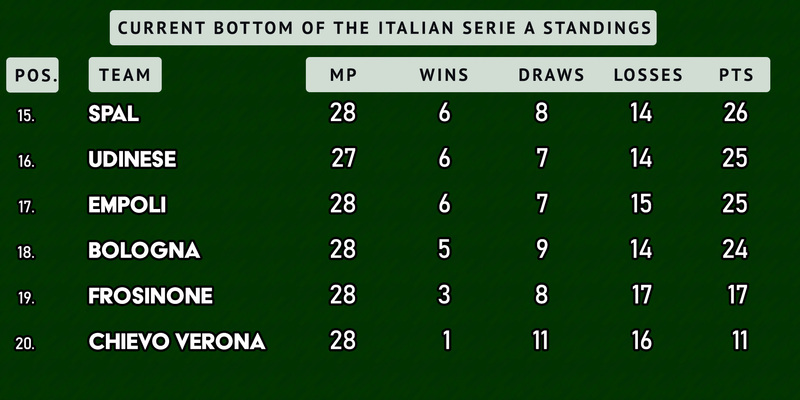 A point away from safety makes Bologna is the most hopeful of the sides currently in the relegation zone. Udinese has a match in hand to help catapult them from the drop, but nothing can be guaranteed at this stage. As things stand, a max of 2 points is separating the sides. 10 matches remaining in the 2018/19 season and Barcelona has a 10 point lead to defend their league title. The gap is close all over the league standings. 10 – the 10-point gap at the top of the league table is the widest in the La Liga standings. 4 – the 4-point gap that separates the rest of the league and the relegation zone is the third largest gap. 2 and below point margin between the remaining teams. 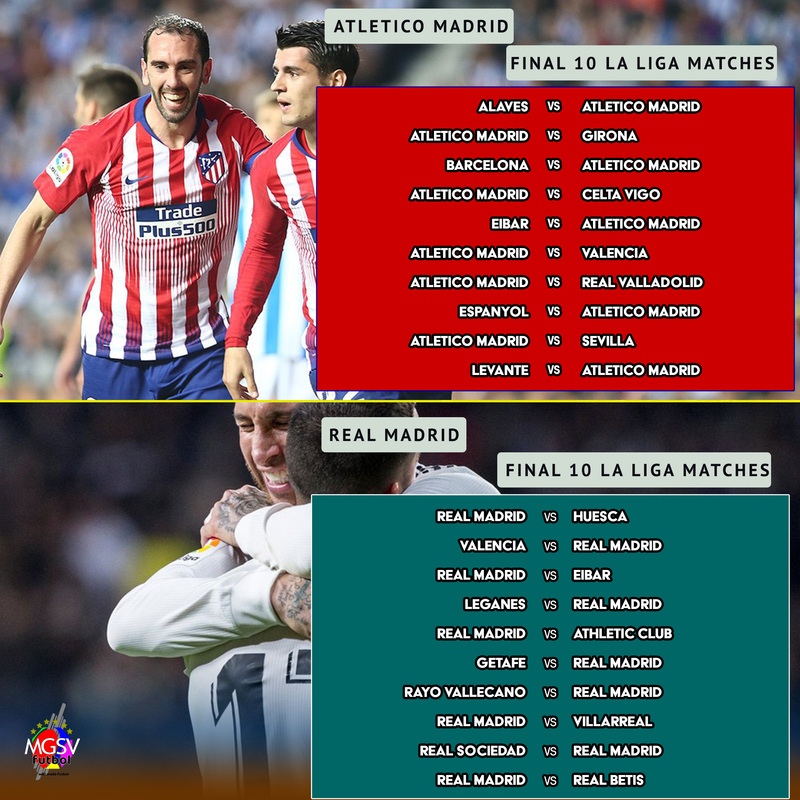 Could Zidane’s managerial return have Real Madrid on the heels of city rival Atletico Madrid in the final 10 matches? 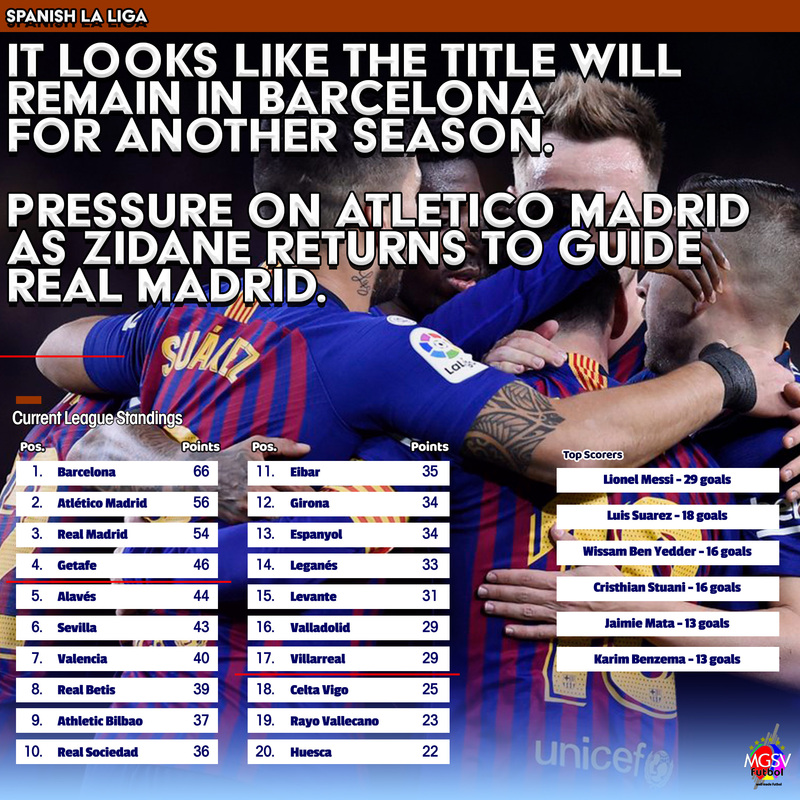 The Madrid derbies for the season is done, so both teams will be counting secondary help as the season comes to a close. No Copa del Rey and No UEFA Champions League for both major Madrid teams. The race is on for who finishes above the other. Deportivo Alaves, Girona, Barcelona, Celta Vigo, Eibar, Valencia, Real Valladolid, Espanyol, Sevilla, Levante. 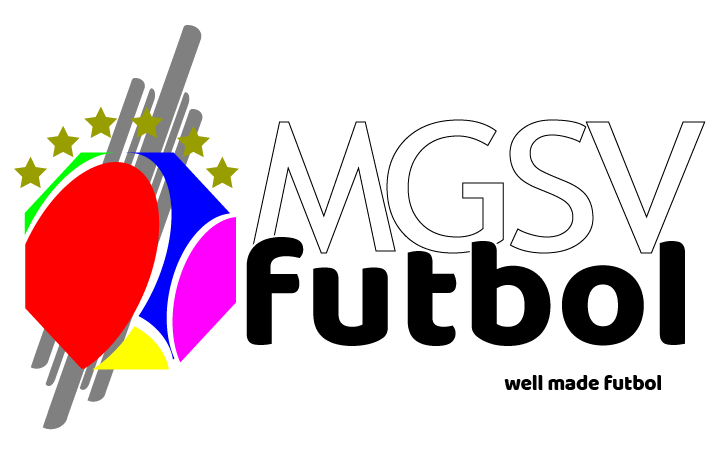 Huesca, Valencia, Eibar, Leganes, Athletic Club, Getafe, Rayo Vallecano, Villarreal, Real Sociedad, Real Betis. 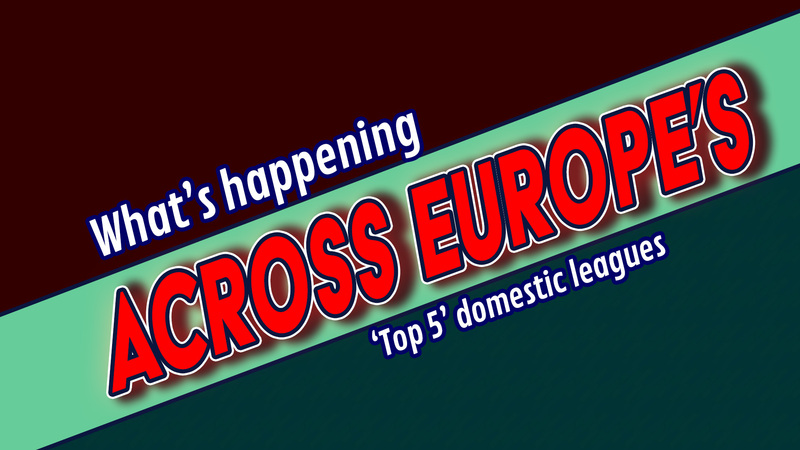 Tightest race to avoid relegation in Europe’s top 5 leagues? There is just a 4-point gap between relegation-zone and survival.